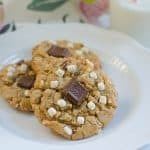 S’mores Monster Cookies – addictive peanut butter cookies loaded with oats, Rice Krispies, pecans, milk chocolate, and marshmallows! How are you celebrating?! Can I suggest my favorite Raspberry White Chocolate S’mores? When it comes to cookies, I either like a plain, boring shortbread or something loaded with everything you have in the kitchen. No in between with me. 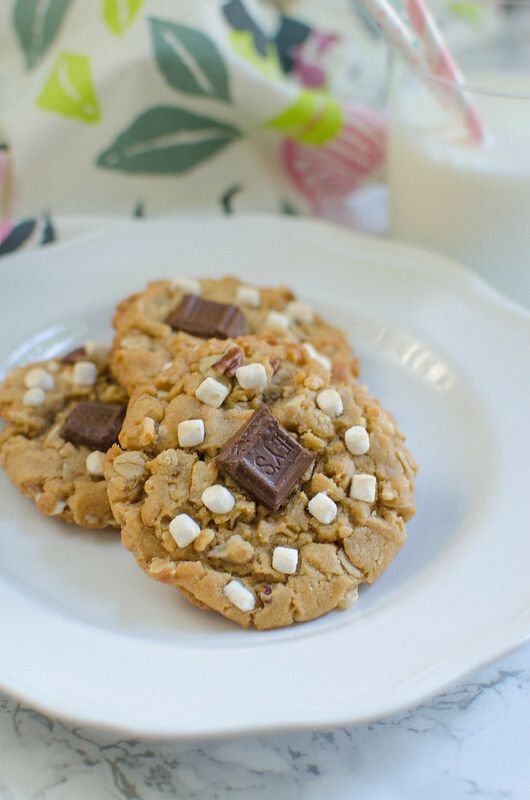 So for these S’mores Monster Cookies, I started with a peanut butter base and then added oats, Rice Krispies, pecans, chopped Hershey’s bars, and tiny marshmallows. They’re delicious and everything I want in a cookie. In the bowl of a stand mixer fitted with a paddle attachment, cream butter, peanut butter, and sugars together until light and fluffy. Beat in eggs and vanilla. In a separate bowl, whisk together flour, baking powder, baking soda, and salt. Add this and the oats to the butter mixture and beat until just combined. Use a rubber spatula to fold in Rice Krispies, pecans, milk chocolate, and marshmallow bits. Drop by rounded tablespoonfuls onto the prepared baking sheet, pressing down slightly.